The 2019 AFL season is set to be an exciting one with plenty of teams in contention for the Premiership! We have a full list of the differing premiership odds for every team at the major Australian online betting agencies here! As always, its tough to find the best price of a certain markets with so many Australian agencies available at the moment and so many more popping up on a regular basis. Usually, if you use the big four of Ladbrokes, Sportsbet, BetEasy and TAB, you can generally find odds that are going to be around the best available at the time. 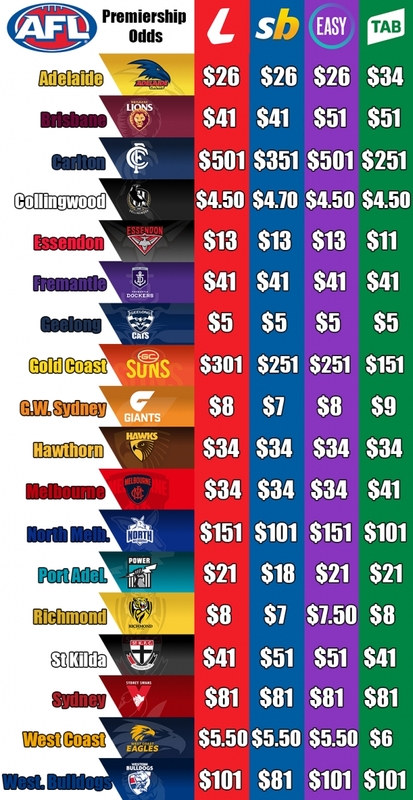 We'll continue to update this table throughout the 2019 season so any time you want to make sure you get the best odds for your Premiership bet, you know where to look! If you fancy a bet on the NRL premiership in 2019 as well, you can check out our NRL Premiership Odds Comparison!